In many computer environments (particuarly on Windows computers) the Enter and Return keys are treated as identical in function. In macOS, Apple has been slowly merging the function of these two keys to the point that, as of this writing, there are very few applications that treat the two keys as being different. Helix has held out on this change, continuing to use the Return key to insert a Return character (hereafter referred to as a ‘linefeed’) into text, while using the Enter key to enter or replace records. In 2007 we surveyed Helix users on this subject and found that most users understood that one day it would become necessary to merge the two keys into a single function. Apple began introducing keyboards with a single key for all Return/Enter operations in 2008, first on MacBooks; then on the wireless keyboard designed for use with desktop computers. Keyboards with a unified Return/Enter key require the user to press the fn key to differentiate between the two functions in applications that continue to treat them as separate, as does Helix. Beginning in version 7.0, Helix no longer (officially) differentiates between the Return and Enter key. In most cases, pressing one or the other now causes the same result. Adding a linefeed is now done by holding the Shift key down while pressing Return, hereafter referred to as a Shift-Return keypress. Inspector fields for properties that support linefeeds, such as comments and validation error custom messages. To aid in the transition from the prior result of pressing the Return key, Helix 7.0 displays a dialog when it is pressed without the Shift key modifier. The dialog — shown at right — provides a dash of humor while explaining the change. Since this dialog may appear in various locations, the label of the default button displays a context-appropriate message for the situation being handled. The user has the option of pressing the Return (or Enter) key again to proceed with the unmodified keypress function (Enter Record, Exit Edit Mode, etc.) or choosing Cancel to return without further action. 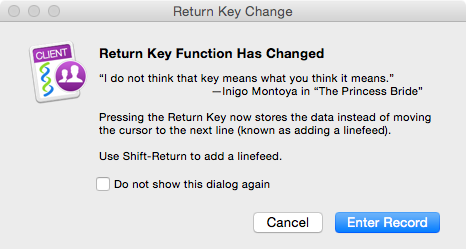 If the intention was to add a linefeed, the user can then use Shift-Return to do so. The dialog includes a “Do not show this dialog again” checkbox, so that once the new behavior is learned, the user can use the Return key without interruption. Inspector properties that do not support linefeeds (e.g. icon name or custom name) convert them into a space character. You can not use a linefeed in a form or power query’s ‘search value’ field. (A pasted linefeed is converted into a space.) We expect to address this in a future release.